The government's “3T” -- Teacher, Tiffin & Toilet -- formula to bring minority youths into mainstream education has been a tremendous success, said Naqvi. Minority Affairs Minister Mukhtar Abbas Naqvi on Saturday said the government does not want to “shut the doors of madrasas”, but it wants to open their doors for mainstream education. 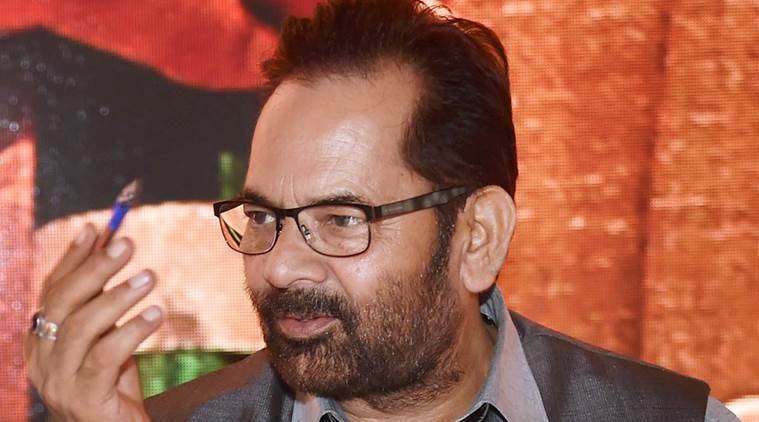 Naqvi made the remarks at an event to distribute certificates to the students who have been successful in a ‘Bridge Course’, jointly conducted by the Ministry of Minority Affairs and the Jamia Millia Islamia, for school dropouts and those studying in madrasas. A statement issued by the minister’s office quoted him as saying that the government’s “3T” — Teacher, Tiffin & Toilet — formula to bring minority youths into mainstream education has been a tremendous success. The government does not want to “shut down the doors of Madrasas”, it only wants to “open their doors for formal and mainstream education,” Naqvi was quoted. He said that steps taken by the Modi government for the educational empowerment of the needy sections of the society, including the minorities, have ensured that the youths belonging to the minority communities are getting better jobs through quality education. In the past about one year, thousands of educational institutions of all minority communities, including madarsas, have been included in the mainstream education system by connecting them with the ‘Teacher, Tiffin, Toilet’ campaign, Naqvi said. He said the school dropout rate among Muslim girls, which was earlier more than 70 per cent, has now been reduced to about 35 per cent due to the educational empowerment programmes of the government. Naqvi said that during the last four years, 2.66 crore students belonging to the poor and weaker sections among minorities have benefitted from various scholarships. More than 5.43 lakh youths have been provided employment and employment opportunities through job-oriented skill development schemes, he said. Naqvi handed out the certificates to the students successful in the bridge course. The Ministry of Minority Affairs, in collaboration with the Jamia Millia Islamia University, had started the nine-months “bridge course” to bring madrasa students and school dropouts into mainstream education system. This year, a total of 260 students had been trained under the course out of which 182 students successfully completed the course. Naqvi said the Ministry of Minority Affairs has also started a training programme to link madrasa teachers with the mainstream education system. Minority Affairs Ministry Secretary A Luikham, Aligarh Muslim University Vice Chancellor Tariq Mansoor; Chairman Guru Harkishan Public School Society S Manjit Singh GK and representative of Diocese of Delhi-Church of North India Bishop Collin Theodore, were among those present at the event.